Do you have difficulty manipulating test strips or inserting them into your blood glucose meter? Can you no longer easily open medicine bottles? Do you sometimes struggle with tying your shoelaces? Many physical problems can interfere with your ability to manage your diabetes and take proper care of yourself more generally. Some of these problems, such as decreased feeling in your hands, may be a product of the diabetes itself, while other challenges such as tremors or poor joint mobility may be unrelated to your diabetes. Managing diabetes successfully requires a broad range of habits and behaviors. According to a model developed by the American Association of Diabetes Educators (AADE) in 2003, there are seven key behaviors that define a healthy lifestyle with diabetes; these are known as the AADE7 Self-Care Behaviors. They are (1) healthy eating, (2) being active, (3) monitoring, (4) taking medications, (5) problem-solving, (6) healthy coping, and (7) reducing risks. Some of these behaviors, such as healthy eating, are pretty self-explanatory, while others may benefit from a bit more explanation. For example, “monitoring” includes not just blood glucose monitoring but also tracking your blood pressure, weight, and foot health, as well as the number of steps you’ve walked throughout the day (to ensure that you’re getting enough physical activity). “Reducing risks” also encompasses a broad group of behaviors, including but not limited to smoking cessation, self-inspection of feet, maintaining up-to-date personal health records, and having regular eye, foot, and dental exams. Reducing risks also includes keeping track of and following instructions from your health-care team. This article focuses on common physical limitations, particularly those that can affect the hands, and how they may affect your ability to perform the AADE7 Self-Care Behaviors. It describes tools and interventions that may enhance or restore your capacity for self-management when you are challenged by one or more of these difficulties. Up to 70% million of the roughly 29.1 million Americans with diabetes have some form of neuropathy, or nerve damage, caused by diabetes. For those with peripheral neuropathy, the primary symptom may be pain in the feet or hands, or it may be numbness, or a loss of sensation, in those areas. Carpal tunnel syndrome is 15 times more common in people with diabetes than in those without it, affecting up to 20% of people with diabetes. It occurs when the median nerve, which runs from the forearm into the palm of the hand, becomes pressed or squeezed at the wrist. It can cause burning, tingling, or numbness in the palm of the hand and the fingers. Carpal tunnel syndrome often occurs in both hands and is characterized by weakness in the hands and difficulty gripping and pinching objects. A person with diabetes is at least twice as likely as someone without diabetes to have heart disease or to experience a stroke. A stroke may result in weakness or paralysis on one side of the body and can restrict someone to the use of only one hand. Although arthritis and diabetes are not related in the cause-and-effect sense, they both share at least two major risk factors: older age and overweight. This means that many people have both conditions; in fact, a report from the Centers for Disease Control and Prevention (CDC) found that 52% of people with diabetes also have arthritis. Arthritis can lead to reduced joint mobility and, in some cases, joint deformity. Although tremors can occur because of neurological conditions such as multiple sclerosis, the most common form of tremor — a rhythmic shaking in the hands and arms that occurs during purposeful movement, known as essential tremor – can occur in otherwise healthy people. This form of tremor affects approximately 5 million people in the United States, with the highest incidence in people over the age of 60. Any of these conditions can make daily tasks — and diabetes care tasks in particular — more difficult. But whether your problems are caused by neuropathy, carpal tunnel syndrome, stroke, arthritis, or something else, there may be a tool or technique that allows you to perform the activity you desire. The simple act of eating usually requires the use of utensils, at least when it comes to most wholesome, healthy foods. This task is made significantly more difficult by weakness in the arms or hands, tremors, and other physical problems. Adaptive eating utensils can be found in a number of mail-order catalogs that offer devices to assist with physical challenges. Weighted utensils may be helpful to dampen tremors. Large-grip handles may be useful if your hand strength is diminished, while a universal cuff to hold utensils can help if you have lost your ability to grasp them. Combination utensils such as a spork (combined spoon and fork) or a knork (combined knife and fork), which cuts food with a simple rocking motion, can help you to eat with one hand. When dealing with physical limitations in food preparation or eating, a few principles of positioning can help you make the most effective use of your upper extremities. In general, sitting down will provide more stability, while standing up will give you more leverage. Stability while seated is maximized when the chair has a back and armrests and the height of the chair allows your feet to be fully planted on the ground. Propping your arms on a tabletop may help minimize tremors. With proper positioning, a weaker arm can sometimes be used to hold down an object or provide minimal assistance. One basic tenet of healthy eating is to consume fresh fruits and vegetables. For fruits and vegetables that need to be peeled, an adaptive peeler may be helpful to some; these devices have a large, horizontal, or palm-style, grip, and clamp-on versions exist for one-handed use. Cleaning certain fruits and vegetables with a produce scrubber lets you eat the peel and benefit from its nutritional properties. Buying prepeeled or precut fruits and vegetables transfers the work of peeling and cutting to someone else. 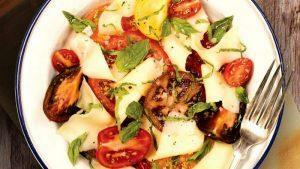 Using frozen fruits and vegetables is another option that requires less work by the cook. For those who wish to cut fruits and vegetables themselves, wearing a fillet glove (a cut-resistant glove with a stainless steel core) or using a knife guide can make cutting safer. Specialized cutting boards allow one-handed cutting, and vegetable slicers and choppers let you chop carrots, celery, or onions by pushing a button, pulling a cord, or squeezing handles together. • The OXO Good Grips Smooth Edge Can Opener leaves no sharp edges as it opens. It is easy to operate and has wide, no-slip handles. • Chef’n manufactures the EZ Squeeze one-handed can opener. This opener is operated by squeezing the handles together to rotate the cutting wheel around the edge of the can. A built-in magnet allows for easy and safe removal of the lid. • The I-Can Can Opener by Progressive International has a ratchet handle that requires less strength and gripping power than a regular twist handle. First the opener is locked onto the can, then the handle is ratcheted back and forth to open the lid; the press of a button releases the device. • The One Touch electric can opener permits hands-free cutting of the lid. Once it is placed on the can and the “on” button is pressed, this opener moves around the can while cutting the lid, then shuts off automatically. As with some other can openers, no sharp edges are left on the can or lid. When you have neuropathy, working in the kitchen can pose a variety of potential hazards. Some basic cautionary measures are listed in “Cooking With Neuropathy.” Keeping a grip on objects when you have reduced sensation in your hands can be a challenge. To avoid having to lift and carry objects, slide them along countertops when possible. Minimize the time you spend holding an object by standing between two surfaces and transferring the object from one surface to the other. Use a cart to move several objects at once. Develop workstations for items that you frequently use together (such as knives and cutting boards) so that no object has to be moved very far. There are a number of steps you can take to make physical activity and exercise more enjoyable and less risk-prone. Putting a nonslip material such as self-adhesive Dycem on railings can make them easier to grasp while climbing stairs. The handlebars of exercise equipment such as stationary bikes, treadmills, and steppers can be wrapped with exercise tubing or padded handlebar tape to help you maintain your grip. Nonslip material or pads attached to the pedals of exercise equipment can help you maintain your footing. If only one of your hands can grip effectively, consider wearing a holding mitt on the other hand when using exercise equipment. This device uses Velcro to maintain your grip on a handle or bar. For resistance exercises, a good option for people who have difficulty with their grip or balance is elastic exercise bands, which can be used for numerous exercises in a variety of positions, including sitting down. 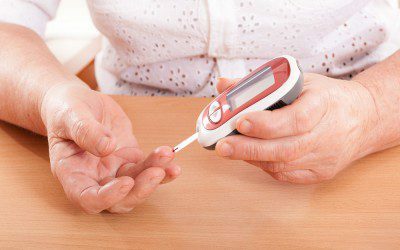 Blood glucose monitoring is a cornerstone of diabetes management, and it requires a fair amount of fine-motor control in the hands. However, several products can make blood glucose monitoring easier in the presence of physical limitations. Two blood glucose meters come with a cartridge or drum filled with several test strips, eliminating the need to insert a test strip each time the meter is used. The Ascensia Breeze 2 comes with a 10-strip circular disc, while the Accu-Chek Compact Plus comes with a 17-strip drum. People with hand challenges might also consider using a meter that has fewer steps to go through, such as one with an automatic on/off function and no coding. Some meters also use larger strips, which may be easier to grasp. A certified diabetes educator can steer you toward meters that have these characteristics. There are a number of ways that lancing can be simplified if you have difficulty grasping or pinching small objects. Accu-Chek has a lancing device called the FastClix that has a drum of six lancets, while a device called the iTest DISQ has a cartridge of 20 lancets. A single-use safety lancet called the SurgiLance can be positioned on a table and operated with one hand. A standard lancing device can also be attached with Velcro to a portable surface, like a tray, for one-handed lancing. For other types of monitoring, such as blood pressure monitoring, work with your physician or another member of your diabetes team to identify tools and techniques that can work for you. Opening medicine bottles can be a challenge when hand strength or joint mobility is decreased. Always remember the cardinal rule when unscrewing bottle caps or lids: “lefty loosey, righty tighty.” Placing a medicine bottle on a low surface where you can lean into it will let you use your body weight to help open it. Putting nonslip matting on the table under the medicine bottle and on top of the cap can help reduce slippage when opening a twist-cap bottle. A number of different bottle openers are available if your hand strength or joint mobility is compromised. You can also ask your pharmacist to package your medicines in bottles with adult caps rather than childproof caps. Several options are available to help people with reduced hand coordination or sensation inject insulin. Using a syringe and vial requires a lot of fine-motor ability, so keeping your arms stabilized on a tabletop will help steady your hands and let you focus on the task at hand. Wrapping a rubber band around the vial and syringe will make them easier to hold onto. A small device called the Insul-Cap connects a vial to a syringe and makes it effortless to hold them both as a unit. If drawing insulin into a syringe is too difficult, switching to an insulin pen may be a good option; using one requires fewer steps than using a syringe, and setting the dose is less likely to be affected by tremors. The dose is simply “dialed in” using the dosage dial. Diabetes is not a static, always-predictable disease. Situations may arise that require a change in your approach; hypoglycemia (low blood glucose) and sick days are two of these situations. Responding to hypoglycemia typically requires drinking a beverage such as soda, milk, or juice, or taking some glucose tablets or glucose gel. If you have reduced hand strength or you experience tremors, opening a beverage container and pouring from it, or opening a tightly sealed container of glucose tablets or gel can be dangerously difficult in cases of hypoglycemia. Beverages used to treat hypoglycemia should ideally be purchased in small, manageable quantities. If you are pouring from a large container, however, try resting the carton or bottle on the kitchen counter and holding the glass in the sink to make pouring easier. Carton holders with a handle can also make it easier to pour from milk or juice cartons, while devices such as tab grabbers, carton openers, and bottle openers are good to have on hand even if you don’t ordinarily struggle with opening containers; you may experience more difficulty when you have hypoglycemia. For glucose products, remove as much of the packaging as possible beforehand so there’s nothing extra to do when you need the tablets or packet of gel quickly. Managing sick days may involve a special diet when you cannot tolerate regular foods. Make sure to have bland, easy-to-digest, carbohydrate-containing foods on hand, such as applesauce or Jell-O. Consider the packaging when you buy these products. Look for foods in shelf-stable cartons or plastic cups if you’d rather not deal with cans. Foods such as saltines, vanilla wafers, or graham crackers are also good to have on hand for sick days, although they will eventually go stale if stored for a long time. If you have trouble opening plastic packaging and would rather not use scissors, consider using a bag opener — a small gadget with a concealed blade. Don’t forget that checking your blood glucose often is more important than ever when you’re sick. Researching adaptive tools and practicing your technique when you’re well will pay off when you’re not feeling well. Having diabetes is stressful, so finding a stress-reduction technique that you can practice regularly is important. Journaling is one way to cope with stress. It lets you express thoughts and emotions related to your diabetes in a thoughtful and productive way, and you may even be able to hash out and solve problems by writing about them. If one of your problems is an inability to grip a pen or pencil, however, writing can be a challenge. To help compensate for reduced hand strength, tremors, or impaired joint mobility or sensation, try using a writing utensil with a large barrel or with an added-on pen or pencil grip. Various styles and sizes of grips are available. A pen or mechanical pencil with a nonslip, rubberized barrel may also be a good option. Weighted pens and pencils can be especially helpful if you experience tremors. A device like the Steady Write pen also helps stabilize and position your grip and is good for people with tremors, arthritis, or limited hand function. Writing on a softer surface, such as a paper tablet rather than a hard table, may also make writing easier. Writing by hand can also be replaced by using a tape recorder or typing on a computer keypad. Behaviors that reduce risks include those that can prevent or minimize diabetes complications and maximize your health and quality of life. Scheduling regular eye, foot, and dental appointments is a key part of reducing your risks. However, dialing a telephone to schedule appointments may be challenging if you have problems with your hands. Adaptive approaches include using a pencil eraser to dial a push-button phone, switching to a phone with large buttons, or using speed or voice dialing to minimize the physical effort required. Showering can be a high-risk endeavor when you have reduced balance or strength. Using a wash mitt with a soap pocket, “soap on a rope,” or a wall-mounted soap dispenser can minimize the difficulty of manipulating soap and a washcloth. A shower seat or bath bench makes it easier to focus on washing yourself, since you won’t need to focus on the balance required for standing. Wearing shoes at all times (except while bathing or in bed) is a key component of proper diabetes foot care, but fastening lace-up shoes can be difficult for some people. You can avoid having to tie and untie your shoes by using elastic laces or shoe buttons, or you can buy shoes with Velcro closure straps. One-handed tying of shoelaces is also an option, although it requires some dexterity in the hand doing the tying. There are several methods for achieving one-handed tying, many of which can be found on the Internet, either illustrated or demonstrated on video. Brushing your teeth and/or cleaning your dentures is also an aspect of reducing your long-term health risks. A toothbrush handle can be built up with foam curlers or tubing to make it easier to grasp, or it can be replaced with an electric toothbrush. One-handed denture care is possible with a suction-cup denture brush. Applying toothpaste to your brush may be easier with a toothpaste tube squeezer or a dispenser, both of which are sold at various big-box retailers. The AADE7 Self-Care Behaviors outline the basics to managing your diabetes. If you have trouble executing any of those behaviors because of physical limitations, there may be a technique or assistive device that can help. Print and online catalogs such as North Coast Medical, Patterson Medical, Maddak, AliMed, www.rehabmart.com, and www.dynamic-living.com all offer a wide range of assistive devices. A number of kitchen merchandise manufacturers also sell products that can make kitchen tasks easier. It may be helpful to enlist the help of a certified diabetes educator or an occupational therapist to provide instruction in adaptive techniques and specialized equipment. Ask your doctor for a referral to one or both of these specialists. Occupational therapists often work in hospitals or rehabilitation centers. Whatever you do, don’t let physical limitations get in the way of managing your diabetes as well as you possibly can. Debra A. Sokol-McKay is a consultant and private practitioner in the field of low-vision and adaptive diabetes self-management.